SS: BISS Can CH Am CH Gillian's Instant Replay, R.O.M. SD: CH Meadow View Csinoska Sarabi, R.O.M. 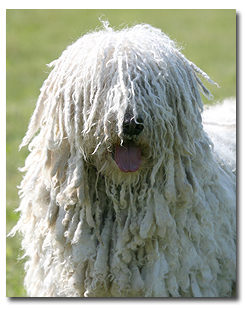 Niea was a stunning female Komondor that we were very lucky to have in our lives. Both her sire and dam were in the top ten of the breed during their showing careers. She was a big girl with a gorgeous head and beautiful corded coat. She stood out in almost any crowd, and was an impressive sight to all that visited our farm. Like most Komondorok she was surprisingly agile for such a large dog and loved to run and play on the farm with her best friend, Tasha. Niea was a sweet girl that loved attention, however, she was all Komondor and took her job as a guardian to our farm and family very seriously. 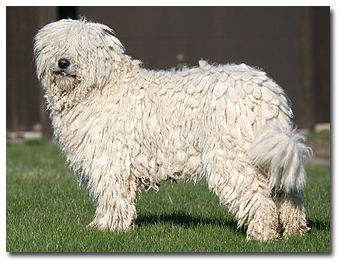 She passed her Canine Good Citizen test and her TDI certification, and though highly unusual for a Komondor, she was a very successful therapy dog. Her calm demeanor, gentle ways, and unique appearance built her quite a fan club in her therapy work. Niea was also one of the few Komondorok that have taken the American Temperament Test Society’s temperament test and obtained the TT title. We we miss her presence and big bark on the farm daily. To view many more photos of Niea please visit her photo album.